Drawing lines through circles to make equal parts isn’t always as easy as it seems. 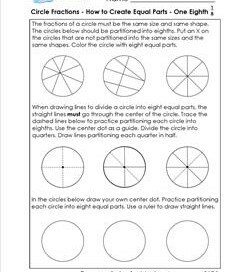 These circle fractions how to create equal parts worksheets give kids the chance to identify a circle with equal parts, follow step-by-step instructions for how to divide a circle into equal parts, and practice creating circles with equal parts. 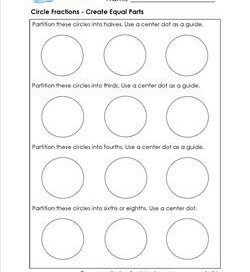 Kids will need a ruler or other straight edge for these worksheets. Here’s the main point – all the lines have to go through the center point! Answer sheets included. 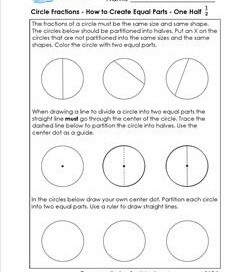 Dividing circles into fractions (equal parts) can be fairly easy, but dividing into thirds is the most difficult of all. Learn how on this page. 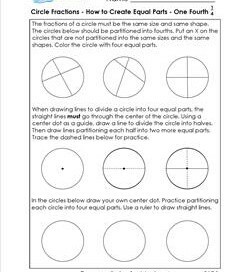 Circle fractions come up again and again when studying fractions. 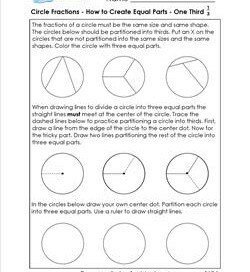 Why not know how to divide them into fractions correctly? Don’t know quite how to create six equal parts out of a circle? Follow the directions on this page and you’ll have it down in no time!